In this video we are going to talk about some things you need to take into consideration when choosing music for your next short film or client project. Welcome to The Film Look and episode 6 of the Video Production Guide. Adding music to your film is another way to tell your story and the wrong music can change the mood and tone very easily and tell a different story than you intended. With each scene in your film you need to think about a few things; what do you want the audience to feel? Will the music drive the scene? For this scene in our short film Keep The Change, our main character is at his highest level of stress as his car has just broken down and if he does not deliver the pizza on time he is going to get fired. In this scene we want our audience to feel the same tension our delivery delivery is feeling. Another question you need to ask when picking music for your film is ‘Will the music work with the other audio in the scene?’. The other audio in your scene could be your character's dialogue and the foley sound effects which also help you tell the story. If you add music into your scene and it is taking away from the story because the other sounds are being drowned, think about having no music, not every scene needs it. Just like a short film a client video has a theme and a mood. 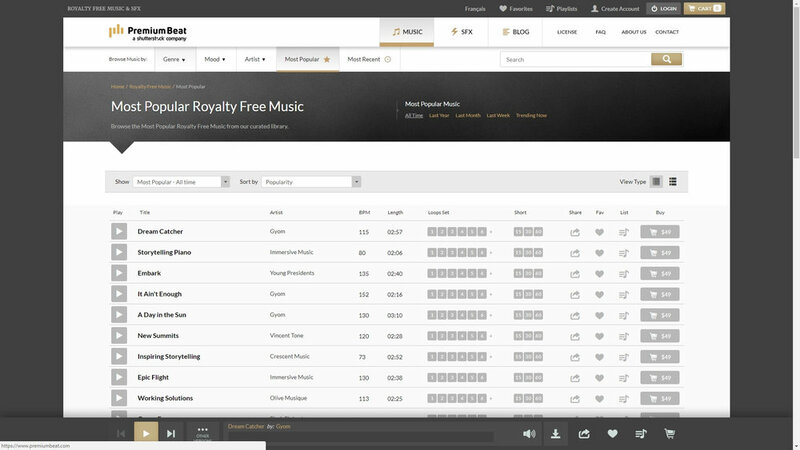 There are lots of different places you can get music for your productions. Places like the YouTube music library is a good place to start and it is free, but after a while you will find it a little limited. We have been using a website called premiumbeat to get all of our music for client videos and short films for over 2 years now. They have a wide range of genres and subgenres, and all of the music you have heard in this video is from premiumbeat. Finding the right song can be time consuming. Sometimes you will find the perfect track right away and other times it will take hours. One of the main reasons we use premiumbeat is because they allow you to download a range of different lengths of the preview track. This allows you to add the track to your edit and see if it fits the tone of your film. On other sites you have to play the track in your web browser, then click play in your editor which can be pain. Just remember to tell your client that music is a preview track, so they aren’t confused when they hear a voice saying ‘premiumbeat.com’ in the background. For the videos we made for this guide we edited the videos to a suitable track we found on premiumbeat, then sent a draft version of the videos to our client. If they did not like the track for whatever reason we can change it without paying for the music. When the video has been signed off by your client, that is when you can purchase the track as you know they are 100% happy with it. 🎵 Click here to download this episode's track. Check out Premiumbeat.com to discover a huge range of exclusive royalty free music! In the last episode we spoke about how to shoot an interview. Most videos will need some form of B-Roll to layer over the interview and that is what we are going to talk about in this video. Welcome to The Film Look and episode 5 of the Video Production Guide. Capturing B-Roll can be done in many different ways, but it will also depend on the type of kit you can afford, and don’t worry if you can not afford the best equipment now. Concentrate on the equipment you do own and make as much money with it as you can. But if you have a slider, use a slider, if your client needs a drone shot price for a drone shot, but remember if you only have a camera and a tripod, a well composed shot always trumps the fancy ones. B-Roll doesn’t just help you shape the interview or voice over into a story, it also helps you hide the cuts you’ve made to the footage. B roll will hide the unnecessary answers, pauses, ums and errs. By using some audio transitions you can blend the audio cuts together and prevent the sound from popping. There are loads of different techniques when it comes to capturing B-Roll, but each shot needs to represent what your client is trying to sell, offer, or promote. Clients love slider shots as the clean movement turns a boring conference room into something more interesting. With some distance between the background and subject, you can create a parallax sliding effect, which can really enhance the shot of a product or piece of art. We have a video all about how to use a slider on our channel. In the last couple of years drone shots have become the new slider shots. Just like slider shots, they can be overused and 95% of jobs usually don’t need them. Unless you have a passion for flying drones, budget in for a professional who already has their wings. It will save you time and money, as getting a drone pilot's licence is expensive and time consuming. If the client is asking for a drone simply because it looks cool, let them know a solid story is always the better option. It’s not all about the fancy shots. Slow motion is great to shoot in if the subject in the frame is moving. Clients love it and it’s really easy to do. Just adjust your settings from 24 fps to, for example 60, and double your shutter speed from 1/50 to 1/100. Then you can half the speed of the footage in your editor. In episode 2 of this guide we spoke about preparing a shot list and storyboards before the shooting day. Use this on the day and tick off everything you wrote down as you don’t want to miss something your client asked you to capture. Take your time when capturing the B-Roll. At first it may seem like it’s less important than any other footage, but the quality of your b roll will make or break the final video. Be patient, and do multiple takes if necessary. When you start to shoot videos you will have the tendency to overshoot, it’s not a bad thing but you will start to realise the more you shoot, the more time you’ll be sorting through the footage, and the more storage space you will need. If the final video length needs to be 2 minutes you don’t need to shoot an hours worth of B-Roll shots. Whatever tools and techniques you use to capture your b-roll shots, remember that every shot needs to help you tell a story. Practice makes perfect, and eventually you will be able to turn up at a location and know exactly what will look good because you’ve likely shot somewhere like this before. And remember to enjoy it! It might feel stressful to begin with, but just remember to take your time and enjoy yourself. http://bit.ly/track-under-the-spotlight - Click here to download this episode's track. Check out Premiumbeat.com to discover a huge range of exclusive royalty free music! Knowing how to shoot an interview is an essential part of making documentaries and videos for clients, but how do you shoot one? Welcome to The Film Look and episode 4 of the Video Production Guide. There are two different parts to shooting an interview, one is the interview setup and the other is the actual conducting of the interview. Let's talk about the setup first. Every location will be different but before you set up your camera, look at the room and see where might be best for the interviewee to sit, then where the camera, lights and microphones can go. Your subject’s eyes should be positioned in one of the thirds of the screen, this can be on the left or the right depending on what is in your background. Having your subject placed like this is little more applying to the eye rather than placing your subject right in the middle of the frame. You can do this but it’s normally when your subject is talking directly to the camera like I am right now. Your interviewee’s eyeline should be always looking into the space and not away from it when being interviewed. The interviewer should be sat next to the camera looking across the space towards the subject's eyeline. If you have a second camera and tripod, capturing a second angle will give you more cutting room as you can cut between the different angles. One setup could to be position your B camera right next to your A camera and having them set at two different focal lengths. A very popular B camera setup is a profile shot of the interviewee. If you have a second shooter they can operate the B camera on a shoulder rig or a slider and change the framing between each question, achieving many different angles. Just make sure you give them enough time to move before you ask the next question. The interview in a client video is there to tell the viewer certain information. This could be about a product or service the company is offering, or someone talking about their experiences. The way the interview looks needs to represent the subject matter. For the example client video we shot for Pamplemousse Recording Studio we wanted to match the mood of the studio, so we used turned on the practical lights in the studio. Then we added an Apture H267c LED panel 2 meters away from the subject, set the brightness to 100%, and the colour temperature to 5500 kelvin. Then we added a 160 LED right of frame with gave Jordan a edge light, which also separated him from the background by lighting up the guitars behind him. There are lots of different types of interview setups, sometimes you will only add one light and sometimes you will need to add three. Here is a basic lighting kit which will work for most situation. We use an Aputure HR672C. You can change the colour temperature, but it’s not the brightest of lights so sometimes you need to get it very close to your subject. The good thing is, it’s a LED light so it doesn’t get very hot. Our fill light is usually a reflector which is used to fill in the hard shadows on our subject’s face. For an edge light we normally use one of these 160 LED panels. Its colour accuracy isn’t going to win any awards, but they are small and for £30 you can’t really go wrong. There are loads of lights and modifiers you can use, but this kit will get you started. There are several different types of microphones you can use when recording an interview. We’ve used on-board video mics, shotgun mics, and clip mics, and they all have their advantages and disadvantages. A Rode videomic pro is a good place to start. They are reasonably priced and have a solid sound. When recording an interview, it’s best to get the microphone off the camera and bring it closer to your subject in order to capture something cleaner and louder. You can extend the length of the cable by using a 3.5mm extension cable like this one. Then throw it on a microphone stand to boom it without an operator. We use a larger shotgun mic for the majority of our setups. This one here is a Rode NTG2. It gets a really nice sound and has very low noise, but it does require an XLR input so if your camera only has a 3.5mm socket, you can pick up something like this Saramonic Smart Rig which will adapt and connect the foreign inputs. Clip Mics are great to use if your subject is moving a lot, or is far away. For a wedding it’s a great way to capture people's vows, or if you’re shooting a conference talk. We recommend to start with a Rode Video Microphone, then upgrade to a shotgun mic when you can. We think a shotgun microphone is a lot more versatile than a set of clip mics as you can record interviews, voice overs, sound effects and Foley with it. Setting up your camera, lights, and sound equipment is not the only thing you will need to do if you’re shooting an interview. You’ll most likely have to conduct the interview as well. If you’ve never done this before, like when we started, there are a lot of little things to learn that comes with experience. For an interview you will need to ask the interviewee some questions. It’s best to ask the client what questions to ask they know more about the subject matter than you do, but do a little research into the person or subject beforehand. If a person is nervous about being interviewed, just sit and chat to them. Go over the questions and answers, ask them questions that are not about the interview, like if they are going on holiday - just get them talking. At times the interviewee might ramble. If this happens, ask them the question again. The rambling was just them figuring out what they wanted to say, and since they now know, the second take will likely be better. When they are talking, try not to speak until you are sure they have finished and leave at least 3 seconds before you say anything. You’ll be picked up on the microphone, and hearing your hums and arrrs in the edit is the worst. Just listen until it is your turn to ask another question. When you ask a question, ask the interviewee to present the question at the start of their answer. This will help them lead into their answer and allow the audience to know what the interviewee is talking about. Here are two examples, one without the question in the answer and one with. For breakfast this morning I had porridge and a coffee. The question was ‘What did you have for breakfast this morning?’ which, by the way, is a good question to ask when your are checking your sound levels. That’s the basics of shooting an interview. Take what we have said and put it into practice. http://bit.ly/pb-brooklyn-bridge - Click here to download this episode's track. Check out Premiumbeat.com to discover a huge range of exclusive royalty free music! In the last few videos we have spoke about how to set up your video production company, get a video job, and work out what to charge. In this video we are going to talk about preparing for the shoot. Welcome to The Film Look and episode 3 of the Video Production Guide. Preparing for the shoot is just as important as the shoot itself. The more you prepare, the easier your shoot will be. When are you available to shoot the video? When do you need the final video delivered? Some of these questions might seem very simple, but if your client needs the video turned around within a couple of days you need to know that before you shoot. Ask as many questions as you can and it will reassure your client that you know what you are doing, even if you’re just making up as you go along. If your client is struggling to express what they want, ask them to send over some examples of other videos they have seen that they like. Taking inspiration from others is perfectly fine, you’re not trying to remake radius of the lost ark. Next you want to write up an agreement contract. This is basically an outline, or some bullet points, of everything you are going to do to make the video, and everything the client will do in order to help you deliver it. No matter the scope of the project, a written contract is there protect you from any legal outcomes if they should arise, such as a client refusing to pay. It’s uncommon, but it does happen from time to time. In the description below we have provided a simple contract we use. Now you have outlined the idea with your client, use this to make a shot list for the shoot. Forgetting to shoot something on the shooting day and having to go back doesn’t look very professional and it is technically reducing your hourly rate. This is your mistake, and you can’t charge extra for something like this. Client videos that consist of sit down interviews, b-roll, or event footage won’t require a script or storyboards. The jobs that do are generally the most fun as there is a clear vision put in place and you can treat it like a short film. We needed storyboards and a script for a shoot with an actor who was interacting with a prop in a particular order. Having a script allowed the actor to know what was required from them and it allowed us to clearly know what we needed to shoot before we got there. and you don’t need a lot of expensive camera equipment, a DSLR, Lens, tripod, and microphone is a good starting point to shoot most things. What ever equipment you have, make sure all of your batteries are fully charged, and remember to bring a few extra spares. If you are going to use lights that need mains power, take a 10 meter extension lead; you never know how far the nearest socket will be. Before you leave, make sure you have all of the production documents and kit. Dress smart/casual; you want to be comfortable whilst working, but don’t want to look like a slob. And remember, don’t be late! http://bit.ly/track-winner-takes-it-all - Thanks to PremiumBeat for providing the music for this week's episode. Check out Premiumbeat.com to discover a huge range of exclusive royalty free music! For the video production guide we created a client video for Pamplemousse Recording Studio. We did this to show the types of videos you can create for small business. http://bit.ly/track-march-of-desire & http://bit.ly/track-fulton-and-grand - Click here to download this episode's track. Check out Premiumbeat.com to discover a huge range of exclusive royalty free music! If someone comes along and asks you to make a video for them, knowing what to charge can be tricky to work out. In this video we are going to give you some tips on how to work this out. Welcome to The Film Look and Episode 2 of the Video Production Guide. First I want to talk about working for free. This is something we all have to do to gain experience, and get footage for our showreels. We have a video where we talk all about working for no pay on our channel if you want check it out. If the first videos you make for someone are for free, it’s a great time to learn the process and work out how long it takes to make a video for someone. Even if you are getting paid for the work this is a good practice as you’ll start to work out what to charge for different jobs, as some will take longer to shoot or edit then others. When you price for the job, tell your client how many days you are charging for pre production, production and post production. It’s good to do this is because your client might look at the price and assume it’s simply for the shooting day. Your client may only see you for the time when you are shooting, but remember this is not just the only time you have worked. You might have spent 1 day planning the shoot, and it’s going to take you 2 days to edit the video. If you’re struggling to work out what price to charge, don’t be afraid to ask what their budget is as it might be a lot more than you were expecting. Now you have this information, what is your time worth? That’s what this video is all about after all. I can’t tell you what you should charge as there are many different factors to consider. First there is your level of experience, the more experience you have the bigger and better jobs you can get which you can charge more. Who is your client? With some clients you can charge more for your services. Don’t expect every client to be able to pay you the same hourly/daily rate. A locally run coffee shop does not have the same marketing budget as starbucks. Your location is important as well. In some city’s like London or New York you can charge more simply because everything has inflated pricing, but if you live in a small city or town there will be a price cap for video production. Finally, every project will be different in terms of how long it will take to plan, shoot and edit. A little piece of advice; in the film industry there is no such thing as a half days pay, so if the shoot is only 2 or 3 hours, you need to charge for a full day as you can’t really do anything else during that day when you are waiting to go to the shoot. Whatever you charge make sure you are always delivering the highest quality of video and service you can. It doesn’t matter if they are offering pennies, give them a video you think is worth hundreds if not thousands. You never know when they may need more work in the future, or when someone asks them if they know any good video people. Living in the digital age; a multitude of businesses, companies, and individuals are looking for videos for a range of different needs. They are also willing to pay for them! That’s where a filmmaker comes in. But, how do you find the work, and how do you secure a video production job? Welcome to The Film Look and episode 1 of the Video Production Guide. So you’re an aspiring filmmaker, you have a DSLR, a microphone, some lights, and you want to earn some cash by using your skills and equipment to make videos for clients. How do you start? At first you may have to work for free to gain experience before people will pay you. We had to do this at the start and we would advise to treat this time as a testing ground to see if making videos for other people is a career path you want to go down. Everyone needs videos making, so contact local museums, artists, events, people getting married, vets, dentists, hairdressers, even make a video about your Gran’s sewing group if you have to! Once you have a few projects under your belt you can create a showreel to showcase your work. Trea t your showreel the same way you would a CV or resume; show the best shots and don’t make it longer than 1 minute. You want it to be entertaining and it’s better to have a snappy 1 minute video than a boring 3 minute one. I’m not going to go into the specifics of setting up a business, that's a whole guide in itself. Instead we are going to talk about some of the specifics of setting up a production company. First you need to pick a name that you will trade under. 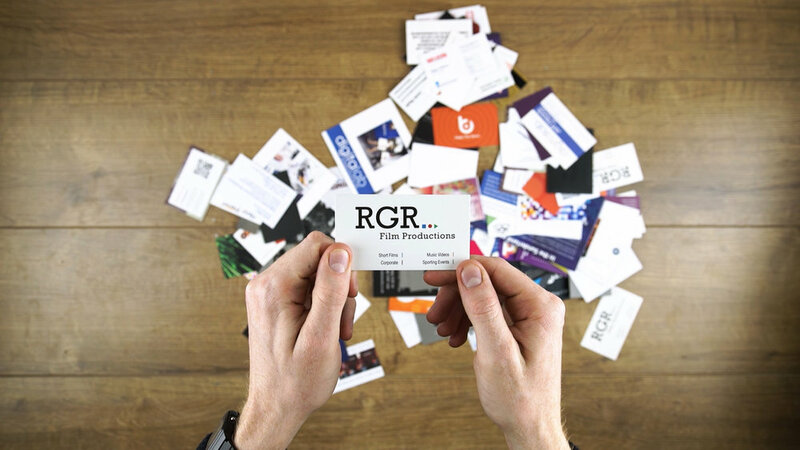 Our production company is called RGR Film Productions. Choose a title which is self explanatory. RGR Film Productions is pretty clear that we produce films, RGR Visual Design could be any sort of creative design business; it’s a bit wishy-washy and vague, so pick something with video or film in the title so a client will know exactly what you do. And spend some time choosing your name too - it’s going to be with you for a long time. Once you have a name chosen, you should create a Facebook page for the business and eventually a website. This will help people find you and it’s a place to showcase your work. Get Instagram and twitter aswell, but only if you are going to use them. Seeing dormant twitter feeds that have not been used in 6 months is a lot worse than not having one. There are lots of inexpensive ways to build your website so don’t stress about it. Wordpress and Squarespace will allow you to create something visual really easy, which is what you should be aiming for. And some advice don’t have a lot of text on your website - your work is visual so show it off. We are not sponsored by Squarespace, but there are loads of other channels that are and they offer discount codes for the site. Keep your branding consistent on your website, social media pages and even your business cards. If you have no experience in graphic design there are lots of people out there that can help, some just starting out like you. Trade services if you can. Business cards are a dime a dozen. A great way to stand out is to have something that’s different from the norm. These were my first set of business cards and they worked, but after a few years I changed them to these. They are a lot more visual and they give a good first impression of what you do. Whilst you are setting up your business you need to be out there finding work, as no one will come to you especially at the start. This is a little different for people and businesses who are just one or two man teams. A great way to contact them directly is by messaging them via their Facebook business pages - write this message in the same professional manner you would an email. Don’t be disheartened if you send 100 emails and only get 10 back, 10 is good. But if you only get 1 email back of someone who is interested, the next step is to meet with them and see how you can work with each other. Even if this is an unpaid job treat this as a job interview; go smart, be prepared, and listen to what they want. And most of all, be honest! Don’t pretend to know something you don’t, nobody becomes David Fincher overnight, and you shouldn’t pretend to be. Other than that, it is all up to you to turn that into a sale. The more people you speak to, the more work you will get, so get to know people! Referrals are how you are going to get 50% if not more of your work. This means networking, and telling people them what you do. I hate networking, but it’s necessary. The trick is to really listen to people; who they are and what they do. Don’t try to sell your business yet as they might not need your services, but they might know someone that does. Last piece of advice will depend on where you live; if there are a lot of art groups, community meeting and talks, go to them and introduce yourself. You will meet people who are very like minded, creative, and someone there will be organising some form of event or workshop...and this is when you can offer to film it for them...it’s a start! So who needs videos making? Well the short answer is everyone. For this guide we have made two different types of client videos to use as examples. One was for Sian Jordan Designs, a watercolour artist, and we made a video that explains who she is and what her business does. We call these type of videos ‘Business Stories’. The second video we made was for Pamplemousse Recording Studio that advertised the services they sell. This is a classic promotional video. The two videos were created for Pamplemousse Recording Studios. The first one was a 20 second advertisement about the services they offer. The second video was 2 minutes long, and goes into more detail about Jordan the owner of Pamplemousse Recording Studios, we call this type of videos Business Stories. Recording Studios are just one example of the type of companies you could contact, but there are loads more so let’s talk about them. These are just two examples of the type of companies you could contact who need videos. There are loads of others so let's talk about them. Our first client job was working for a museum filming artists creating art out of glass then interviewing them about their work. These jobs taught us how to work with a client, finding out what they need, how to shoot interviews with many different types of people, and turn videos around quickly. Corporate videos come in many different shapes and sizes. We have already spoken about Business Stories and service based promotional videos, but you also have fundraising videos, factory tours, and high concept videos which have a short film structure and tone to them. From my experience if you want to make music videos, just advertise that you only make music videos. It’s easier for local bands to find you as they don't have to look through all of the other work you have created. Music videos are a great way to just concentrate on the visual story as the sound has already been recorded for you. Event videos come under many different categories like locally organised events, music festivals, night clubs videos, and corporate conference events that are not the most interesting but can be turned around quickly. Filming weddings can pay well and it’s a good way to get used working fast and thinking on your feet (which will hurt as the shooting days will be long and the editing days will be even longer). Just music videos, if you’re going to shoot weddings it might be best to separate your main production company from the wedding side. A bride doesn't need to see how well you can shoot a corporate video, they need to see how well you can capture their special day. If a business comes along and says ‘yes they would like a video making’ even if it is for free, or you find out there is an opportunity to apply for a video contract, you will have to write something called a proposal. A proposal is a formal document that outlines the approach of how you will make the video for them. 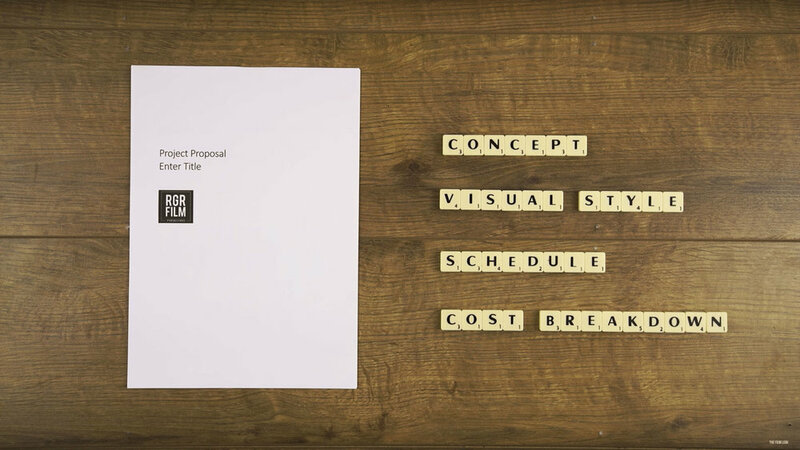 In the document you will outline about the concept, visual style of the video, the schedule, and cost of the project. In the description below you can find a word template we use to write our proposals, with some examples of what might be written in each section. After you have spent about a day writing the video production proposal, they may short list you and ask you to go in and pitch the idea. Pitching is like a job interview (which no one likes doing), but my advice is learn your pitch back to front, and be passionate about why you want to use your skills to make them a video. You will win some jobs and you will lose some, and it sounds daft to say but if you don’t get the job don’t worry about it. Failing to get a job is a learning experience, so send them an email and just be honest about getting feedback to help you learn. They might give you some advice which helps you get the next job. If you did get the job... congratulations! In the next video we are going to talk about how to prepare for the shoot. The last piece of advice I would like to give you is this: most people get into making client videos to help fund their short films. There are a lot of people who lose sight of their original goal and turn more into business people than filmmakers. The money can be good, but never lose sight of why you picked up a camera in the first place, and tell the stories you want to tell with the money you have made telling other people's. http://bit.ly/stanza-pack - If you're looking for stylish transitions for your video, then check out "Stanza" by RocketStock. You’ll be cutting from scene to scene like a pro with this bold pack of 200 plus video transitions. http://bit.ly/track-phenomenal - Click here to download this episode's track. Check out Premiumbeat.com to discover a huge range of exclusive royalty free music! We have been doing this for about 5 years now, but making a video for a client is something they don’t teach you in film school and there is a lot that goes into making them than just shooting good looking video. Yes a lot of filmmaking techniques are transferable when making these videos, but how do you get a video production job in the first place? How much do you charge? And what are the main steps to deliver a video to your client? To help you work all of this out we have create two different types of client videos one for a watercolor artist and the other for a recording studio. To help work all of this out we have create two different types of videos for Pamplemousse Recording Studios. Then we have broken the process down into a 7 part video guide that talks about how to get a job making a video for a client to delivering that video. We’ll start of by talking about how working for free will help you gain experience, and help you turn unpaid work into paid work by creating a showreel with the footage you have filmed. Once you have a showreel you need a place to put it so people can find you, but you also need to be approaching business to offer your services. We are going to talk about the types of people you can contact who need videos making. Spoiler Alert, it’s everyone. A difficult question to answer is “how much do you charge a client for a video”? We have broken this down to help you work that out. Once you have agreed on the price and the type of video your client needs, you need to prepare for the shoot with a script, shot list, and getting your kit ready. Shooting interviews is a big part of making client videos. There is a lot to learn, and that doesn’t just mean shooting them, but conducting the interview as well. Once you have shot everything you will need to edit the videos and deliver them to the client. We are going to talk about our editing workflow that we use to help turn videos around faster. We have spent the last 5 years making videos for others, and we want to help guide you through the process. http://bit.ly/track-fulton-and-grand - Click here to download this episode's track. Check out Premiumbeat.com to discover a huge range of exclusive royalty free music!